• For quantitative determination of succinate (succinic acid) in food, beverage, agricultural products, and other biological samples. • Fast and sensitive. Use 20 µL sample. Linear detection range 10 to 400 µM for colorimetric assays and 2 to 40 µM for fluorimetric assays. • Convenient. The procedure involves adding a single working reagent, and reading the absorbance or fluorescence after 30 minutes. Room temperature assay. No 37°C heater is needed. • succinate in food, beverage, agricultural products, and other biological samples. • Colorimetric assay: 10 µM; Fluorimetric assay: 2 µM. • SUCCINATE, or succinic acid, can be found in all plants and animal tissues. It is an intermediate in the citric acid cycle and plays an important role in intracellular energy generation. Succinate is widely used as a flavoring agent in the food, beverage, and pharmaceutical industries due to its low toxicity. 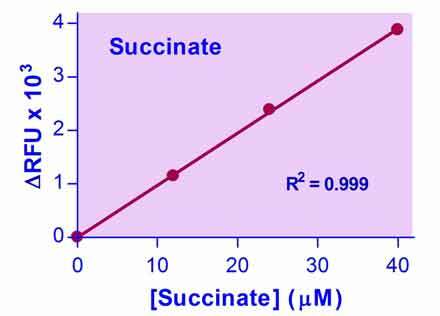 BioAssay Systems′ succinate assay provides a simple, one step assay for measuring succinate. In this assay succinate is converted to pyruvate which reacts with specific reagents and dye to form a colored product. The color intensity at 570 nm or fluorescence at Fex/em = 530/585 nm of the reaction product is directly proportional to succinate concentration in the sample. 1) Does the assay kit work in particular species? And what samples have you tested? Yes, our assays work in all species. We have tested in red wine, soy sauce and urine samples. 2) I don’t have the correct wavelength filter, will the assay still work? Typically if you are within ±20 nm the assay will still work, but have slightly reduced sensitivity. Some assays have a narrower peak than others, call our tech support for a spectrum to verify. 3) I don’t have a 96-well plate, will the assay kit work in a 384 well plate, cuvette, etc? Yes, the assay can be used in any standard plate and cuvette. Simply adjust the total reaction volume to your container. For 384 well use 50 µL, use a narrow cuvette for 500 µL. 4) How do I prepare cell or tissue samples for assays? Cell Samples. Suspend about two million (2 x 106) harvested cells in 400 µL PBS on ice. Lysis can be achieved by homogenization (10-20 passes in a Dounce homeginer on ice) or by sonication (preferably performed in an ice-water bath). The degree of cell lysis can be checked under a microscope. Centrifuge homogenate at 14,000 g for 10 min. Transfer the clear supernatant into a clean tube. It is prudent to run a pilot test of the sample at different dilutions. Choose a dilution with the readings in the linear range of the standard curve for further assays. Most samples can be stored at -80°C if not assayed immediately. Tissue Samples. Start with 20-100 mg tissue, add 200- 1000 µL ice-cold PBS. Lysis can be achieved by homogenization (10-20 passes in a Dounce homeginer on ice) or by sonication (preferably performed in an ice-water bath). The degree of tissue lysis can be checked under a microscope. Centrifuge homogenate at 14,000 g for 10 min. Transfer the clear supernatant into a clean tube. It is prudent to run a pilot test of the sample at different dilutions. Choose a dilution with the readings in the detection range of the standard curve for further assays. Most samples can be stored at -80°C if not assayed immediately. Urine sample: no dilution necessary for colorimetric assays; 1:10 in H2O for fluorimetric assays. 5) Can I store unused reagents for future use? 6) Do I need to use a standard or standard curve with each assay run? Yes, standard curve should be performed with each fluorimetric assay run. Internal standard should be included with each colorimetric assay run.